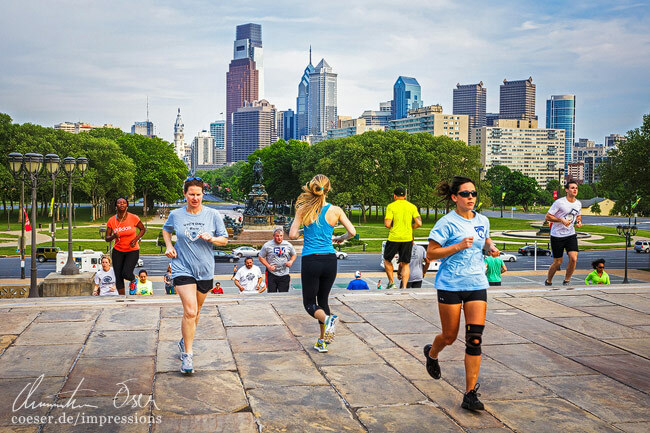 Runners practice on the Rocky Steps at the Museum of Art in front of the skyline. Läufer trainieren auf den Rocky Steps beim Museum of Art vor der Skyline. Close-up of the LOVE sculpture by Robert Indiana in Philadelphia's Love Park. 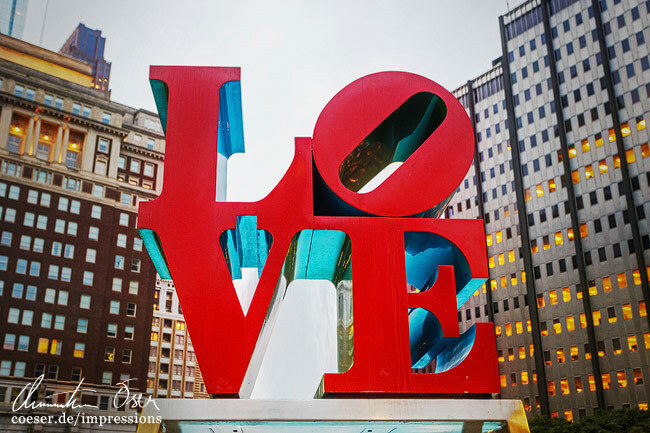 Nahaufnahme der LOVE-Skulptur von Robert Indiana im Love Park in Philadelphia. 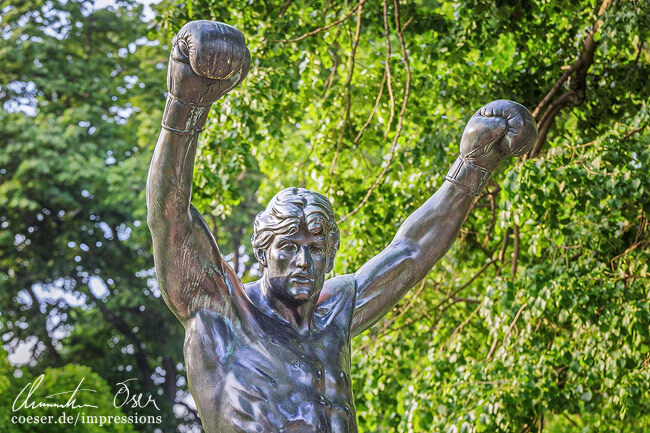 Close-up of the Rocky statue featuring actor Sylvester Stallone. Nahaufnahme der Rocky-Statue, die Schauspieler Sylvester Stallone porträtiert. 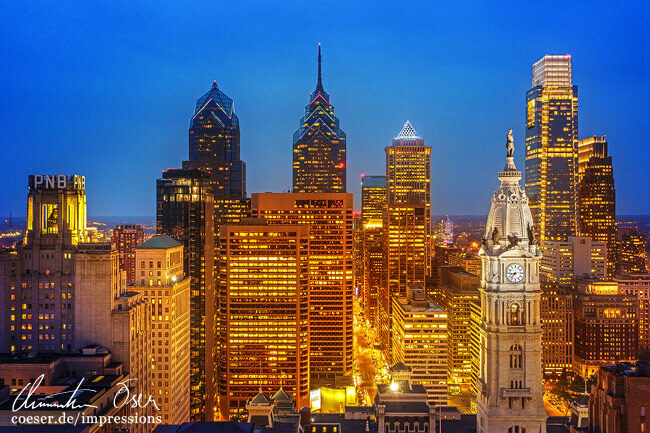 The illuminated Philadelphia skyline with its skyscrapers and the City Hall. Die beleuchtete Skyline von Philadelphia mit ihren Wolkenkratzern und dem Rathaus. 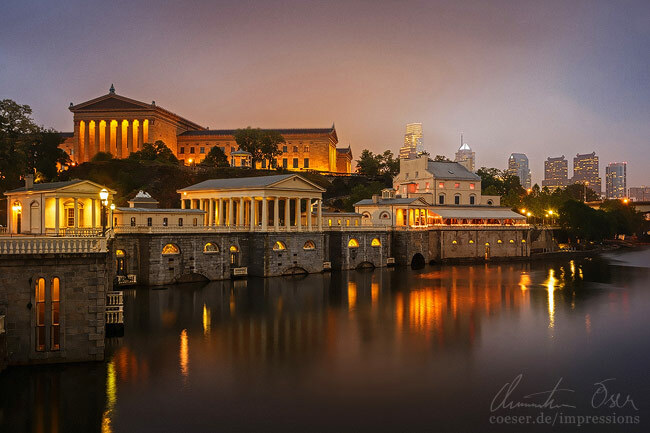 The illuminated Philadelphia Museum of Art and the old Fairmount Water Works. Das beleuchtete Philadelphia Museum of Art und das alte Fairmount-Wasserwerk. The illuminated Boathouse Row and its reflection in the Schuylkill River. 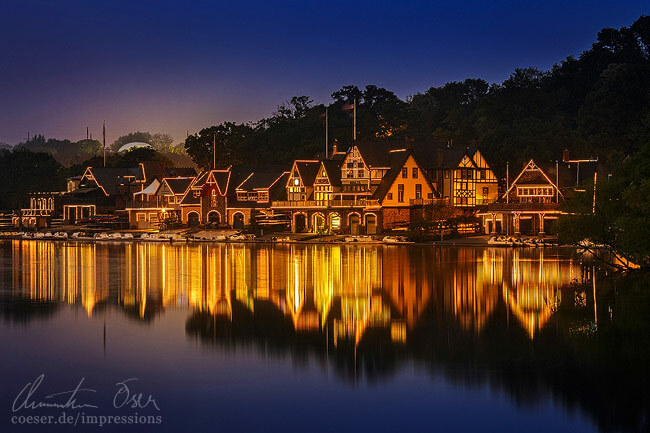 Das beleuchtete Boathouse Row and ihre Spiegelung im Fluss Schuylkill River. 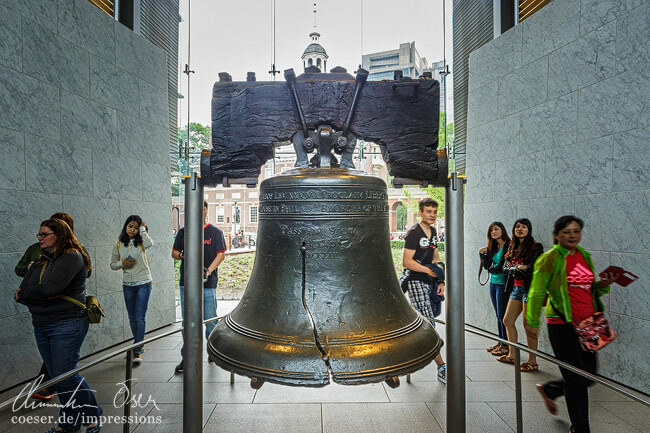 The famous Liberty Bell in the Liberty Bell Center. Die berühmte Liberty Bell Glocke im Liberty Bell Center. 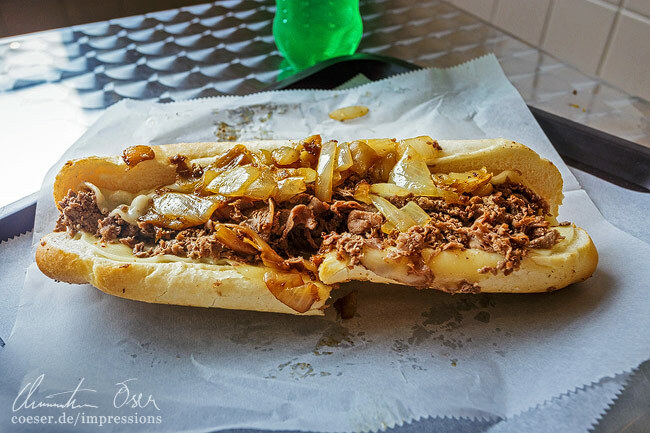 Close-up of a delicious Philly Cheesesteak. Nahaufnahme eines köstlichen Philly Cheesesteak. 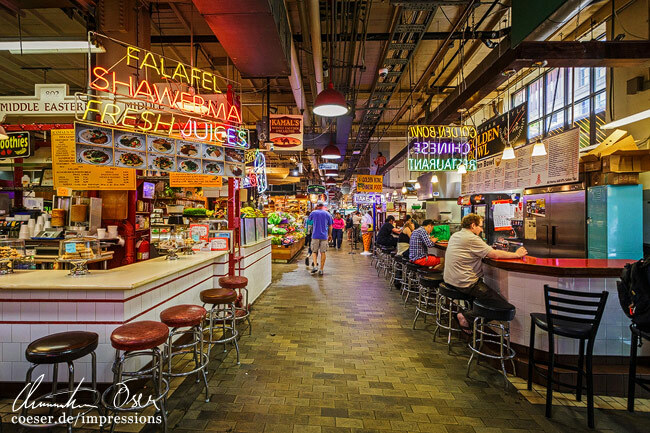 Interior view of the Reading Terminal Market hall. Innenansicht der Markthalle Reading Terminal Market. 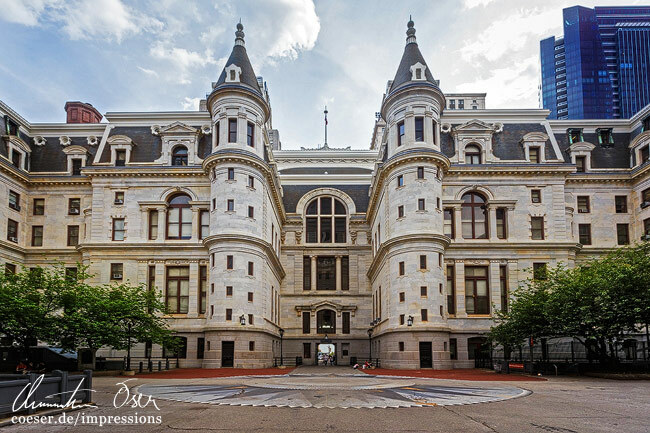 The courtyard of the Philadelphia City Hall. Der Innenhof des Rathauses von Philadelphia.